Senior Program Officer at Tata Trusts, Paresh J. Manohar shares how Tata Trusts is working closely with different state governments under the Saansad Adarsh Gram Yojana to drive rapid model village development across the country. Looking back at the administrative challenges faced by local governments and philanthropies like Tata Trusts in planning and implementing development initiatives, he stresses the importance of data-driven governance and why various stakeholders involved in the decision-making process must embrace it. Q1. Why does India need data-driven governance? Ans. Even after 70 years of independence, we still have a lot of problems with our planning systems and processes. On one hand, we live in a data-driven world. On the other hand, our planning systems are primitive with heavy reliance on paper-based surveys, registers and files. Auditors collecting data on paper-based surveys have a number of loopholes. There are instances of data loss and incorrect data entry. If you collect your data today, you get your village development plans only after 9 months, by which time 40% of the data will become irrelevant. There is a lack of communication between the various stakeholders, such as technology partners, implementing partners, the local village communities (Gram Sabhas) and volunteers. They work in isolation, in silos, and don’t necessarily speak to each other. With this data-driven governance approach, we can look at development as a whole in an integrated way. Q2. 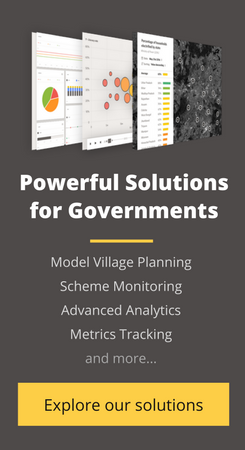 How has data intelligence affected government at the district level? Ans. In the past one and a half years, we have interacted with around 17 lakh (170,000) people in 4 states with 4 different languages and 4 different technology and implementing partners. We’ve trained around 3,200 volunteers, young people from the local communities, each with their own unique languages and culture. We interacted with hundreds of line department officials like BDOs (Block District Officers), aanganwadi workers and ASHA workers. Working with rural, rurban and tribal blocks in Chandrapur, Maharashtra, was a great learning experience for us. Technology initiatives like the Collect app from SocialCops helped us to act immediately. With in-built flagging, questions in local languages and a number of on-ground pilots, we were able to create VDPs (village development plans) in just 3 months! District Collectors in Chandrapur, Balasaur and Vijayawada are using these dashboards extensively. With these dashboards, they are getting the right data at the right time and the right place. Q3. What role will data and technology play in the future of governance in India? Ans. We don’t believe that mere data will solve all the problems. Data is a tool to understand the problem. In today’s digital age, technology has the potential to change lives, and there are communities who want to change their lives. We are helping communities to own this data. When we come up with VDPs, we ask the Gram Sabhas to validate these plans, help the district administration to implement these plans, and empower local village communities to own these plans and the process. This data-driven governance approach can help the planners, policy-makers and local administration make this world better. We partnered with the Tata Trusts and Government of Maharashtra to drive targeted village microplanning for one of the most diverse districts of India. The district administration of Chandrapur used these data intelligence tools to create comprehensive village development plans. Read the full case study here. Want to know how philanthropies like the Tata Trusts use data intelligence tools for targeted village microplanning and other development initiatives? Learn more about our platform here. I enjoy this write up. I am interested in this publicly.